Make a Bead-Loom-Woven Bracelet or Choker with Slide Closure! Fees: $69 » including all materials and printed instructions, plus $15 for loom and needles. A wide variety of bead and cord colors will be available. 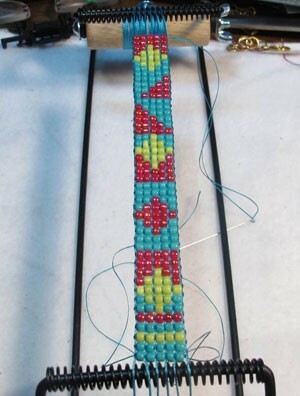 Learn to set up and weave on a Native American style bead loom and create a beautiful, beaded bracelet or choker with a braided, macrame slide closure! In this class, you’ll learn to design your own weaving patterns, take home a finished bracelet or choker, and learn a unique, easy-to-use method of finishing off your woven projects. Choose from a wide range of bead and cord colors! For more information and to sign up for the workshop, email susan@susanryza.com or call 310-944-1299.